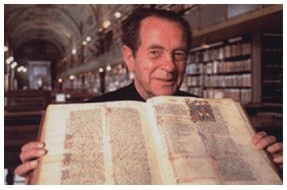 Father Leonard E. Boyle, OP taught palaeography, codicology, history and diplomatics at the Pontifical Institute of Mediaeval Studies from 1961 to1984, with cross-appointment at the University of Toronto’s Centre for Medieval Studies. His renown as a teacher and scholar served as a magnet for medievalists throughout North America and abroad. At his death in October 1999 he was Prefect Emeritus of the Vatican Library, where from 1984 to 1997 as Prefect, he had welcomed researchers from all over the world. In the year 2000 the Institute initiated a campaign to fund a permanent Chair in Manuscript Studies to honour the memory of the late Father Boyle. The Andrew W. Mellon Foundation of New York supported the campaign from the outset, toward a goal of (Cdn) $2.5 million over five years. The remainder of that grant was claimed, on schedule, during the period covered by this Report, with a substantial “overrun” in the endowment, due in part to unusually favourable investment opportunities. We feel that Father Boyle would be particularly gratified to know of the generous response from the many aspiring medievalists whom he taught over the years, and in particular, from his own Dominican Order, which like the Irish Dominican Province, was among the lead supporters of our campaign. We trust that the Chair will serve to perpetuate Fr Boyle's legacy to medieval scholarship with distinction. On 1 July 2007 the Institute appointed Dr Michèle Mulchahey, formerly of the University of St Andrews, Scotland, as the first holder of the Leonard Boyle Chair in Manuscript Studies. Professor Mulchahey, a Canadian landed immigrant, is an internationally known scholar with an academic career on two continents. Originally from Los Angeles, her first studies were at Rice University in Houston, Texas, where she did her undergraduate work in medieval studies and in biological sciences. From Houston she came to Toronto and in 1981, took an MA degree in Medieval Studies. With further studies at the Pontifical Institute she qualified as a Licentiate in Mediaeval Studies in 1985, and was awarded the PhD in Medieval Studies at the University of Toronto in 1989. After taking her first academic appointment, she continued working at the Institute under the direction of Father Leonard Boyle, OP and concluded her formal academic qualifications in 1996 with a dissertation fulfilling the requirements for a Doctorate at the Pontifical Institute - the M.S.D. Professor Mulchahey is only the twelfth of the Institute's alumni – and the third woman among them – to hold both the M.S.L. and M.S.D. degrees from the Institute. Her research for the latter degree was published by PIMS in 1998 as, “First the Bow is Bent in Study ...”: Dominican Education before 1350. In 1997 she brought out as well an edition of Fra Nicola da Milano's Collationes de Beata Virgine: A Cycle of Preaching in the Dominican Congregation of the Blessed Virgin Mary at Imola, 1286–87 in the Toronto Medieval Latin Texts series, also published by the Institute in 1997. In addition to her appointment at University of St Andrews, Professor Mulchahey has taught at Fordham University in New York, at St Mary's College of California, and at the University of Victoria in British Columbia. In 2003–04 she was a Visiting Professor at Harvard University, teaching at the Villa I Tatti in Florence. She is a Fellow of the American Academy in Rome, having won the Rome Prize Fellowship of the Academy in 2002–03, and her many awards in recognition of her scholarship include grants from the National Endowment for the Humanities, the Social Sciences and Humanities Research Council of Canada, and the Carnegie Trust for Scotland. In addition to the academic affiliations already mentioned, Professor Mulchahey is a member of several professional societies, including the American Catholic Historical Association, The British School at Rome, The Canadian Society of Medievalists, and the Medieval Academy of America.